When a pirate ship inadvertently sails over the lost city of Atlantis, an adventure-seeking girl – who happens to be the granddaughter of Poseidon himself – makes friends with a charmingly naïve sailor, causing their two worlds to collide. 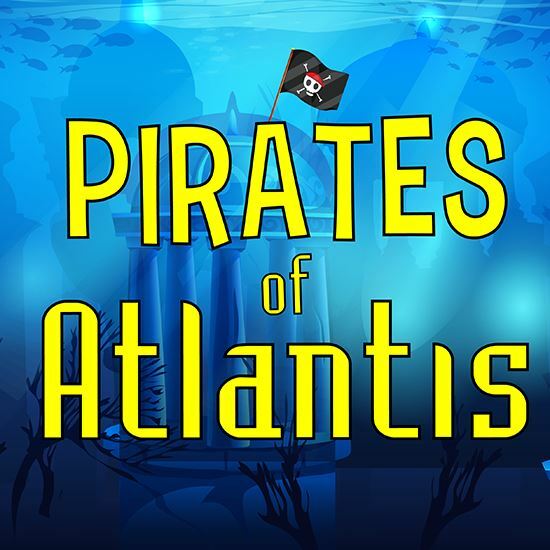 As the pirates continue to arrr-gue and the Atlanteans ask an endless series of questions with no answers, new friends Duffle and Pana explore strange new worlds they have never seen before. With the help of a Narrator giving advice and a friendly dog who just wants to play, and with Poseidon’s undersea magic adding to the drama, there is plenty of action and fun in this story of treasure untold… until now. Run-time: Approximately 45 minutes. A: Every year I write an original play for my fifth grade music students and I take inspiration from their suggestions. A couple of the boys with strong ties to their Greek heritage suggested a Greek mythology, but I had recently directed a middle school production with that theme, so I was looking for something different and came up with the idea of the lost city of Atlantis. Since that already gave us an underwater world to work with, it was easy to imagine that a group of pirates might intersect with that world. Once I had those groups of characters to work with, it was fun to write a story that tied them together. A: When the Narrator and Poseidon squirt the audience with water guns during the maelstrom it’s pretty fun! For that matter, all the moments that wink and nod to the audience are exciting for children actors; it’s gives them a chance to acknowledge what they’re doing and keeps the performance stakes from getting too high. I also like all the references to mermaids because those lines challenge the audience to be rational along with the doubting pirates but then also suspend their disbelief along with the Atlanteans, who are fantasy characters themselves. A: I made them all up, but used Greek words as well as pirate and nautical terms for inspiration. With the pirates, I knew I wanted certain personalities to come through and they all are really individual: snarky Scurvy, the fashion-conscious Anchor, the fastidiously clean Swashbuckle, Scallywag who loves everything about being a pirate and my favorite, clingy Barnacle. With the Atlanteans, it was all about developing a rhythm in their speaking and letting the absurdity of their constant questioning come through as humorous. Of course, the Narrator is probably the most important part but I hadn’t even thought to include a Narrator until one appeared suddenly in Scene One! A: I always try to create a vehicle for expression that will foster a love of theatre in the children who participate in it. If the students I first write a play for come away feeling successful, proud and full of joy, then I have achieved what I set out to do. Passing that script on for other directors to achieve with other groups of children is quite a blessing.